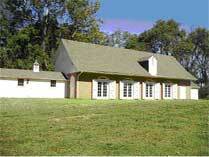 Mount Harmon Plantation is open to the public May 1 through October 31, Thursday through Sunday, 10:00 a.m. ~ 3:00 p.m. Guided tours are conducted on the hour, beginning at 10am, the last tour is conducted at 2pm. Admission includes guided tour of manor house and plantation kitchen, as well as self-guided tour of gardens, grounds and nature trials. Picnic area is available for tour visitors to bring a picnic to enjoy on the grounds. To schedule a tour, receive a free Mount Harmon brochure, and for more information, contact Friends of Mount Harmon, Inc. at (410) 275-8819 or e-mail at info@mountharmon.org. School Field Trips & Special Group Tours by appointment year round. 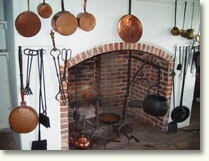 Call FOMH at 410-275-8819 for special school and group rates, and to schedule your visit back in time today. Groups of 8 or more, please call in advance for reservations. We are not open on national holidays. Admission includes guided tour of the manor house and self guided tours of the grounds and nature trails. Call for Education Program & Special Group Rates. Arriving by land: Mount Harmon’s scenic two-mile entrance lane has welcomed visitors by land for over two and a half centuries. 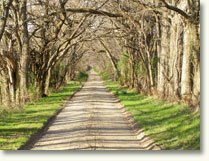 The picturesque gravel entrance lane transports visitors back in time to a bygone era and is lined with gracefully cascading Osage Orange trees. Proceed 1.8 miles to end of entrance lane. Follow signs for visitor parking. Arriving by water: Come to Mount Harmon by boat, as colonial-era visitors to Mount Harmon did in the 18th century. Mount Harmon is proud to welcome registered visitors and members via our new dock, located to the right and up the shore from the Prize House. The dock has a 30 ft T-head and floating dock. Dock coordinates are 39.22.44 N. 75.56.17 W. Head left from dock and follow arrows and mowed trail to manor house. All visitors by boat must register at Manor House (porch entrance) or be FOMH year round members. Visitors by boat are welcome May – October, Thursday – Sunday, 10am – 3pm, during tour hours. Year Round Members may enjoy the dock year round. Visitor check-in: is located at the porch terrace entrance of the manor house. Restrooms are located in brick pool house adjacent to visitor parking. We suggest you plan to allow at least one hour to tour manor house and surrounding grounds, and additional time to tour the nature trails and prize house. Mount Harmon hosts weddings and special events throughout the year, so please be sure to follow visitor check in signs and/or call prior to your visit for updated weekend information. Living history and colonial craft demonstrations can be included with group tours by prior arrangement for additional fee. Recommendations for area restaurants to visit before or after a tour or to contact to arrange for a boxed or picnic lunch can be made by emailing info@mountharmon.org. The manor house is a three-story, five-bay, brick double pile structure which restoration architect Albert Kruse dated to 1730. The house is listed by the National Register of Historic Places. The manor house has been restored to the 1760 – 1810 period and is furnished with American, English, Irish and Scottish antiques, to reflect Mount Harmon’s owners of that period, who actively traded with the British Isles. The Chinese Chippendale staircase and elegant furnishings reflect the refinement of plantation culture in early America. Mount Harmon was not only a successful tobacco plantation, but a local center for tobacco shipment for the Sassafras area. It boasts the northernmost existing tobacco prize house. “Prize” refers to the huge wooden screw used to compress tobacco from two casks into one for more efficient shipment. Housed in the renovated plantation stables, the Education & Discovery Center features a Mount Harmon Highlights in History Exhibit, expanded educational programs, and is available for special and community events. 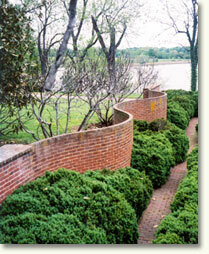 The formal boxwood garden enclosed by serpentine brick walls evokes Mount Harmon’s golden age. Between the boxwood garden and the manor house are a pair of magnificent English Yew trees (Taxus baccata, variety dovastonii). These 200-year-old yews may be the oldest in the United States. A network of nature trails provides easy access to the plantation’s pristine natural surroundings – a historic Tidewater landscape, little changed by time. The trails allow visitors to explore the plantation’s scenic waterfront, rare tobacco prize house, and diverse ecosystems full of wildlife. Wildlife is abundant at Mount Harmon. The entire plantation is a nature preserve, and all forms of plants and animals on the property are protected. Visitors are requested not to pick the flowers or otherwise disturb plants and animals. Several rare and formerly endangered species live at Mount Harmon. 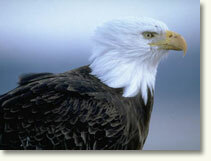 A pair of American bald eagles nests in the vicinity and can be seen hunting over the plantation. The American Lotus (Nelumbo lutea), a relative of the water lily and the largest wildflower in the United States, is rare in Maryland and neighboring states but abundant at Mount Harmon with its peak flowering in August.